I have tried them before (not great). However, how do you kill a frog to eat? Serious question. This is one of my favourite home-cooked dish. 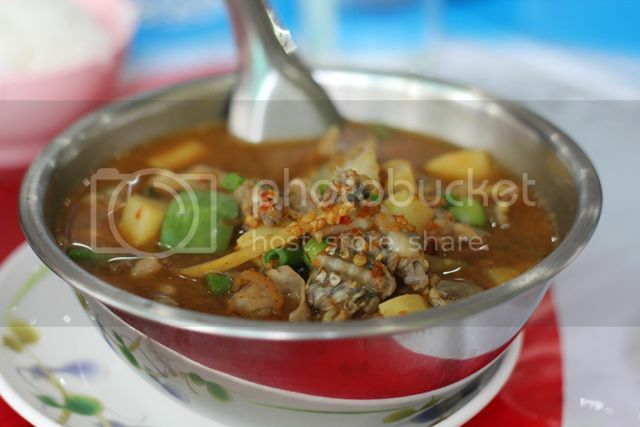 It has a mixture of young bamboo shoots, Thai eggplant, pea eggplant, fiery chillies, strips of ginger-like krachai, big clumps of simmered basil, and the meaty chunks of frog meats made it spectacular. OK, better the cook does it. Thanks. Anyone like to try this frog legs recipe? Hit it over the head with a rolling pin? Just chop its head off? I don't want to cut it's head off while it's still alive but I did like the swinging it by the legs and smacking on the table. Kind of like, Oopps , sorry, now I have to cook it. I ate Thai frog for the first time today. What did it taste like? I don't know. The frog was fried until it was very crispy and then smothered in a very hot spicy sauce. It could have been anything. Anyone tasted it like this? They call it Sashimi, but judging from the of images I would rather call it a merciless Ikizukuri. Eung, to the locals. Putrid filth to you or I. Although when added to a soup with several thousand chillis and a fistful of ginger it's actually quite nice.